Oral hygiene for braces. Young girl with dental braces cleans her teeth. Teen girl cleaning and brushing teeth with clear ceramic braces using special brushing tools. Dental floss. Portrait of girl. Teeth cleaning, braces. 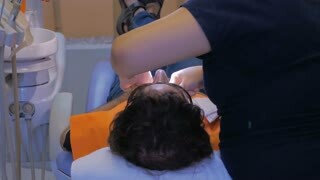 A dentist flossing a man's teeth shot from behind showing a comfortable dental chair and modern clinic. Young blonde woman flossing her teeth in the cab her car. Woman and teeth floss. Crazy woken man with a hangover in the bathroom flossing his teeth. 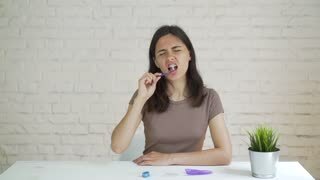 Beautiful woman flossing her teeth. Close-up of unshaved man holding dental floss near his teeth. He wants to flossing his teeth. Close-up of a man who is flossing his teeth. Dental care. 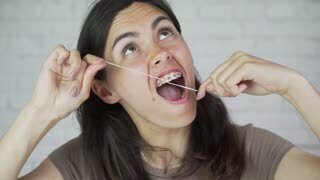 Young woman using dental floss.